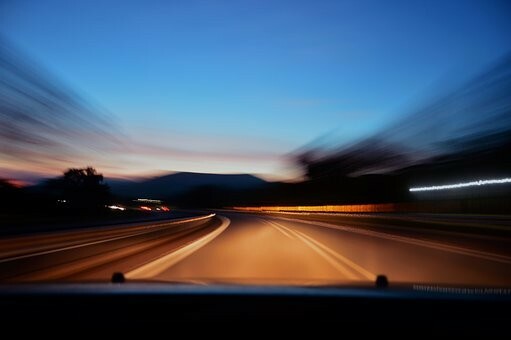 Do you drive to work in the dark? And drive home in the dark? Work commutes are at an all time high in Canada as the cost of living and housing forces most employees to live in remote bedroom communities hours away from their workplace. But while lower housing costs may be a plus for workers, driving long lonely hours on our dark highways is a decidedly dangerous and costly trend. Dark to work and dark to home makes Jack a tired driver. And a very dangerous driver. Driver fatigue is a major factor in car crashes. The Canadian Association of Chiefs of Police reminds us that 20% of fatal collisions involve driver fatigue. In fact, 60% of Canadian drivers admit that they occasionally drive while fatigued and 15% admit that they fell asleep behind the wheel in the past year. share the drive with a responsible friend and co-worker. drifting onto the shoulder of the road or drifting over the centre line. While social media campaigns make inroads and remind us of the need to be aware and rested behind the wheel, technology still lags behind when it comes to concrete, affordable and accessible solutions. Driver Fatigue Monitoring Systems are in development and are slowly gaining traction in both urban bus networks and private commercial fleet operations. Driving facing monitoring cameras focus on the face of bus drivers and truck drivers and detect differences between alert face and tired face. Those bus drivers, bus passengers, truck drivers and all they meet on the road will ultimately benefit from in-cab tech, but the units remain expensive and the technology in its infancy. Privacy concerns, particularly the collection and sale of personal data for profit, also need to be addressed in the balance between tech for good, it's potential for significant road safety, and our personal information security. Until cameras, sensors and driver assist devices become standard, reliable and secure, commuters must default to old school methods of awareness and self-monitoring. But those Transport Canada stats are far from encouraging. If you have been injured in a car crash, and you suspect the at fault driver was fatigued and driving drowsy, let the investigating police officer know. If the police didn't attend the scene, then make sure it is in your Collision Reporting Centre report. Then call an experienced injury lawyer. Experienced injury lawyers know that a car crash is never just an accident.